Whether you're woolly and rugged, or dapper and refined, you need the right accessories to match your lifestyle. We've got you covered with this premium 100% leather toiletry bag. It's handcrafted by one artisan from start to finish and proceeds go directly to vocational schools providing education in Honduras. Children who would not otherwise go to school get an education and learn trade skills creating an opportunity for a better future. Click here to be notified by email when Handmade San Marcos Leather Toiletry Bag becomes available. Mission Lazarus takes a comprehensive approach to development that includes education, medical care, and vocational training programs. Students in vocational training programs receive wages for their work as well as formal schooling and, in turn, the opportunity for a better future. 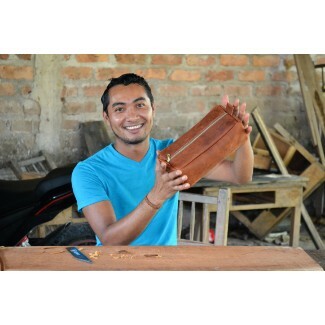 Students are trained in sewing, leather working, boot making, carpentry, or coffee farming. Additional proceeds provide education for children in-need. Your purchase today ensures children in Honduras will have a better tomorrow.